But I didn’t want a side salad. I wanted something hefty that could pass as a meal on its own. For starters, I replace the couscous with quinoa, which has more then twice the fiber as well as more protein, iron and a host of other minerals. I also may have gone a little crazy with all the extra ingredients I added. I ended up putting in everything green I could get my hands on: peas, green beans, mint, cucumber, celery, lime, arugula. A can of white beans made it in there too… I know, I know, it sounds overwhelming, but I promise, it’s just fresh, delicious and filling. Spicy arugala, salty feta, crunchy celery, crisp green beans. And the mint and lime made it so bright and summery tasting. I wanted to go back for a second helping, but I literally just didn’t have the space in my tummy. Serves 4 - 5 (dinner) 6-7 (side) | Total Time: 35 mins. 1. Wash the quinoa and place in large bowl. Add 3 cups of hot water and bring to a boil. Simmer without a lid on until the all the water has been soaked up or evaporated (about 15-20 minutes), stirring frequently at the end. 2. While the quinoa is cooking, wash and drain beans and add to large bowl. Chop celery, cucumber, green beans and onion. Add all the veggies except the green beans to bowl, including the arugula. 3. In a pan, briefly steam the green beans so that they turn bright green but still have a crunch about 3 to 4 minutes. Run under cool water, pat dry and add to bowl. 4. Wipe out pan with a paper towel and use it to toast the almonds in, stirring every now and then so they brown evenly. Set nuts aside. 5. 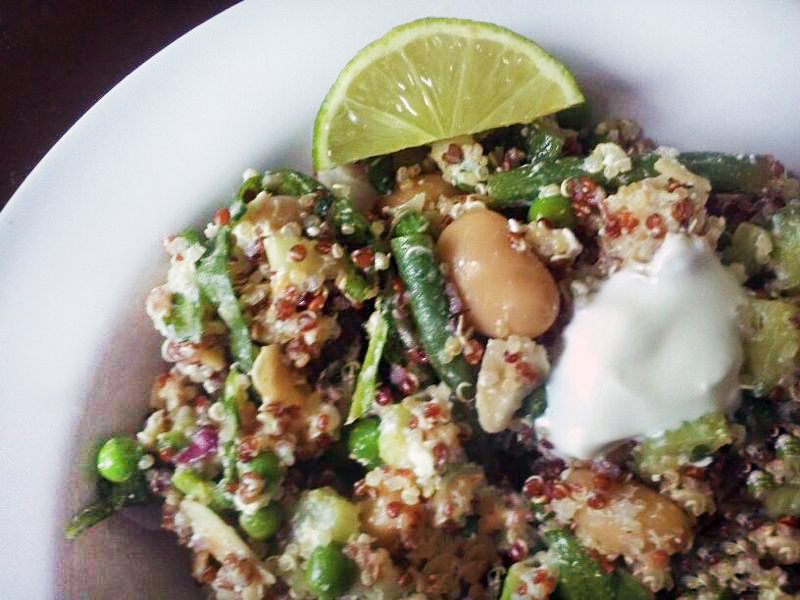 When quinoa is done, remove from pot into a separate bowl and add frozen peas. Allow the mixture to cool before adding it to the rest of the veggies. 6. Crumble in feta and add almonds, chopped mint, lime juice and olive oil. Season with salt and pepper to taste. Serve with plain or Greek yogurt and more lime.